The constant bleating of vuvuzelas at the 2010 World Cup in Africa will long be remembered. With Ukraine and Poland set to host the 2012 European Championships, locals have decided it is a perfect opportunity to promote vuvuzela's European cousin. Remember the hallmark sound of last summer’s soccer World Cup – the distinctive drone of the traditional South African horn, the vuvuzela? Its equivalent for the Euro-2012 Championship to be held in Ukraine and Poland is going to be a whistle called ‘zozulica’. It is named after and shaped like a cuckoo and, just like the vuvuzela, it dates back thousands of years. 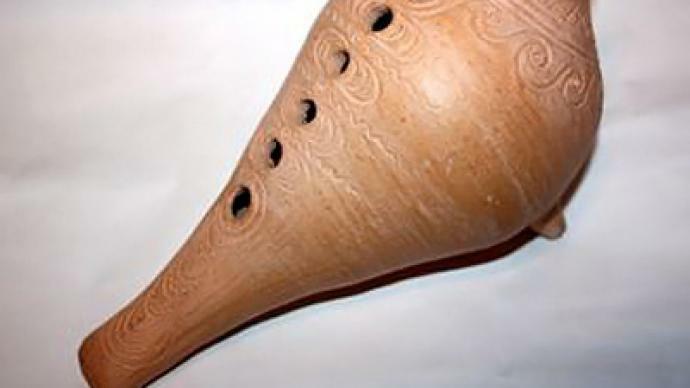 Those behind the idea to use zozulicas at Euro 2012 say they will try to avoid the vuvuzela effect, which brought complaints from some that the powerful pitch of the African horn was irritating and drowned out the atmosphere. Unlike the monotonous roar of a vuvuzela, the Ukrainian musical instrument provides a far more melodic sound, and anybody can play just about any tune. Professional folk musician Maksim Berezhnyuk says any football fan could master this instrument in no time, and those particularly keen could play even more than just football songs. A zozulica costs under US$5, coming in various sizes in either clay or plastic. But Lesya Denisenko-Eryomenko, a potter, who has been making the birdies for most of her life, says the more natural the zozulica, the more positive its vibe. Those pushing the zozulica, hope it will become the unofficial emblem of the Euro 2012 Championship. The sound filling stadiums next year in Ukraine and Poland will indicate how successful they have been.